We here at On The Rocks are not only writers. Point of fact, we spend far more time reading than we do writing. And we probably spend at least as much time talking about what we read as we do creating something new. In honor of this fact, we thought it would be fun to share with you – our readers – our lists of five books everyone should read. You will note some overlap in our two lists. Even so, we hope you will not find the instances where we both have listed the same book redundant. Our arguments for why you should read this work are similar, yet sufficiently different to where you should be doubly persuaded instead of twice as turned off. We hope you will explore our recommendations, and add these works to your library as we have. The power of this book is the way Goldberg allows Progressives to speak for themselves. The Left has not changed at all since the French Revolution. Goldberg presents Progressivism as a malevolent force whose ideas are always the same, but are always re-branding themselves as good and noble to new generations of well-meaning yet misguided men and women who have neither read nor learned from the past. The Left represents the greatest threat to the American experiment, and in this environment, Goldberg is like the prophets of Israel, warning God’s people to turn aside from false idols. This is one of the most influential books I have ever read. The late Tom Wolfe is one of the great writers of the 20th century. A brilliant satirist who loved picking apart Liberal elite social culture. I read this collection of essays while in college, and it forever changed my understanding of the social justice movement in America. Wolfe’s focus was not racism or poverty. Rather, he exposed the way in which the upper-class – particularly the rich, Liberal elites of Manhattan and San Francisco – used social justice issues to inflate their own egos and compete for status amongst themselves; and in doing so acted the fool. It is a modern-day variation of The Emperor’s New Clothes, made all the more poignant because the stories are not fiction. Wolfe is first and foremost a journalist, able to put his finger on the cultural pulse of society and present it to the reader in a well-written, clear and delightfully satirical package. It is hands-down one of my favorite reads. This book changed my life. Randy Alcorn pulls Heaven out of the realm of the abstract and breathes life into it. He speculates, yes, but speculation that is based on what we can read in God’s Word. There is a surprising amount of clarity in Scripture regarding Heaven, which many Christians pass over by quoting the famous verse “Eye has not seen, nor ear heard, nor have entered into the heart of man the things which God has prepared for those who love Him.” (I Corinthians 2:9 – ESV). But they fail to quote the very next verse: “But God has revealed them to us through His Spirit.” This book will open your eyes and excite you for what is to come. They are fascinating books and well-written, if a little dry. Sowell’s writing is clear, concise, and convincing. I cheat here by including two books in one. However, I can do this not only because these books are two different sides of the same coin, but also because it’s my blog and I can do whatever I want! Both books deal with the issue of Social Justice and racism in the United States. Discrimination and Disparities deals with one of the foundational pillars of the social justice movement: that disparities in socio-economic circumstances are a result of discrimination. The Quest for Cosmic Justice deals with how both classical liberals and Progressive Social Justice Warriors deal with the assumption that discrimination is a root cause of socio-economic disparities, and how these ideas have been around for centuries. Most people – and even many Christians – accept the fundamental tenants of Darwinian Evolution without ever examining the foundations on which they are built. Most people believe that since evolution is the scientific consensus, that it means that all the evidence must point towards an old-earth worldview. Many Christians, also, who believe what God’s Word says about a young-earth are conflicted as to why all the scientific evidence seems to point towards evolution. In Icons of Evolution, Jonathan Wells – who earned his doctorate in Cellular and Molecular Biology at California-Berkeley, and is not a Christian so far as I know – utterly dismantles the pillars of Darwinian faith with clear and devastating arguments. After reading this book I wondered how any rational human being could believe in Darwinian Evolution when the pillars on which it is built crumble under the lightest scrutiny. It truly is astonishing. Anyone who is a Christian will love to keep this book in their library as yet another proof that you can trust the Bible. 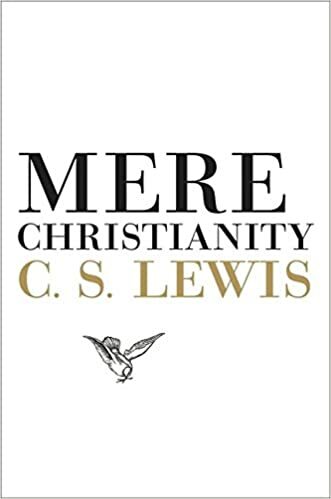 I remember when I read Mere Christianity by C.S. Lewis for the first time being struck by the profundity of a Christian thinker. I had to pause frequently after only short bursts of reading, sometimes only every few paragraphs or pages. Eventually I finished reading Mere Christianity for the first time, and even went back a second time. That is a rare thing for me with even my favorite books. I also went on to read other works by Lewis. For one of them, I nearly put ‘A Grief Observed’ in this place. However, the sincerity and elegance I first encountered in Mere Christianity had, I believe, the greatest effect on me. I count this work among the chief influences on my own writing style and voice. More importantly, though, the core concept which Lewis articulated in this work – that Christ is enough for us to build our identity around – this I find deeply compelling. In short, it rings true and good and necessary. And I should think every Christian would benefit greatly being exposed to it by reading this work by Lewis. I encountered Mann’s history of the Americas early in my oil & gas career when looking for something to listen to while driving around the Montana countryside checking wells. As with Lewis, I ended up reading Mann’s work not once, but twice. And it was just as good the second time. More importantly, I have found myself referencing this work regularly in subsequent years. Initial accounts by European explorers described highly developed civilizations spread out all across both North and South America. However, accounts from the generation of explorers which came a century later found mere fractional traces of this. What happened? Racist historians at some points dismissed pre-Columbian civilization as barely worth studying or mentioning. The earliest accounts, they said, were merely tall tales. The pendulum then swung too far the opposite direction. In recent decades, indigenous cultures were romantically re-imagined as noble savages, at least spiritually superior to the Old World societies. According to Mann, however, Native Americans prior to Columbus were far more advanced than the racist deniers wanted to believe. They were also far less perfect and far more human than the romantic idealists have re-imagined. Cross-referencing numerous historical accounts with the latest archaeological evidence, Mann paints an enthralling and realistic picture. We now know advanced, sprawling civilization existed for thousands of years in the Americas prior to the arrival of Europeans. What I love about 1491 is how it demonstrates that there is far more we do not understand about history. In fact, we know only a small fraction of what many “experts” like to pretend they understand. There is still much more to study, explore, and grapple with about the long and diverse histories of the tribes of mankind, particularly where the Americas are concerned. Fast-forward to the 19th and 20th centuries. 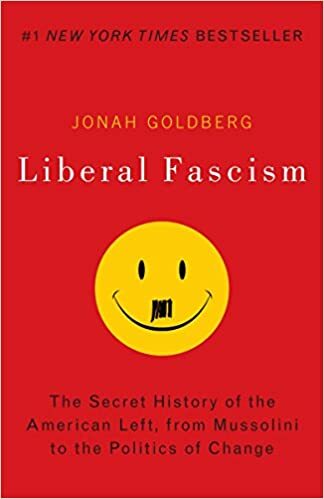 In Liberal Fascism, Jonah Goldberg traces the origins of the modern American Left to its intellectual and philosophical roots. By turns funny and shocking, Goldberg explains the ignorance of referring to fascism and Nazism as right-wing ideologies. In fact, both were products of the Left. Did you know Hitler and Mussolini were initially adored by the American Left? Did you know Progressivism in America has always been a kind of kissing cousin to the Fabian Socialism which sought to transform Great Britain for Marxism gradually over time? Whether gradually and in nominal peace, or quickly and violently, Goldberg makes the case that the modern American Democratic party has since Wilson and FDR sought to transform America into a society fairly opposite what the Founding Fathers intended when they broke away from Britain in the 18th century and adopted our present Constitution. The Left never completely rules out violence or coercion to achieve its goals. However, instead of a harsh German fatherland or cold mother Russia, the Left in America brands itself a benevolent nanny state. For this reason, many Americans fail to perceive the great threat. I would trace my personal political awakening to reading Liberal Fascism; after reading it, I became convinced of the true nature of the political contest in America. Moreover, it was in reading Liberal Fascism I suddenly realized what a long game the Democrats are playing. It is futile to compromise with them. They do not intend ratchet back any bolt once they have been allowed to first tighten it. 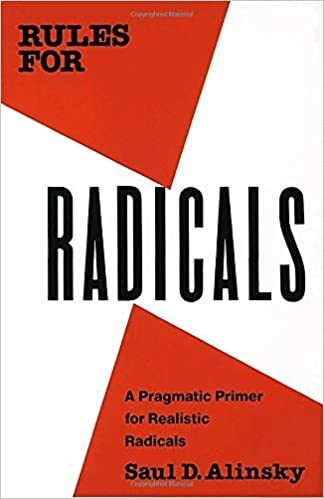 After reading Liberal Fascism, I became interested in Saul Alinsky’s pivotal work, Rules for Radicals. Alinsky was the father of modern American community organizing. If you were not familiar with what community organization is aside from knowing Obama began his political career doing it, you could learn here. It began as an inherently Marxist endeavor, and has remained so. Alinsky was an avowed Marxist, and his purpose for organizing communities was to mobilize them for Marxist causes. Yet he did this in very dishonest ways, and he is surprisingly candid in admitting this. Alinsky argues, like Machiavalli before him, that the ends justify the means. And just as Machiavelli advises that virtue is a hindrance to being able to outmaneuver your enemies, but pretending at virtue is very convenient to achieving and maintaining popular support, Alinsky says the best radicals keep their noses as clean as possible and play their hands as close to the chest as possible. Yet in reading Alinsky, I felt not so much as I was reading a book merely dedicated to Satan; I felt as though Satan had himself dictated the work, and Alinsky merely transcribed it. So dishonest, manipulative, dirty, and downright evil is Alinsky’s approach to politics, and so destructive to America have been his efforts and his legacy, that we must acquaint ourselves with him in order to appreciate the severity of the threat posed by the American Left to basic goodness, decency, sanity, and godliness. There is no moral equivalence between the Right and Left in America. The sides are clearly good versus evil, safety versus destruction. And we must choose between them. In my study of politics, war, and human nature, I have paid special attention to the way violence has been meted out throughout history. Particularly as a Christian, I have given a lot of thought to the morality and human cost of war and violence. Is it ever justified? And, if so, when and how is it? Toward the end of answering these and related questions, I was drawn to On Killing. In Lt. Col. David Grossman’s On Killing, the career U.S. Army psychologist makes a study of the psychological barriers to taking another human life. Showcasing historical examples, and citing professional interactions as a mental healthcare provider to military servicemembers, Grossman outlines what is required to overcome the psychological barriers to killing. At least equally important, he also explains the psychological cost mortal violence exacts. The conclusion of the matter is this: we should be very careful in making the decision to go to war. And the cost must be counted not only in time, materials, and manpower. The psychological forces which work against taking another human life are very strong. To go against these requires great intentionality, and risks breaking men’s minds and hearts. The less physical and emotional distance there is to deadly violence, the greater the trauma experienced by the participants. Whether being asked to kill, or having the enemy try to kill them – war is hell. Men who go to war and live to tell about it are forever altered by the experience. Let us make certain what is gained or preserved by war is worth that.